Last year, the web was ablaze with conspiracy theories when the news of Osama Bin Laden's death was announced to the world on the exact same day as Adolf Hitler's death was 66 years earlier, May 1st. Most of these conspiracies included the belief that Osama bin Laden hadn't been killed at all, because the Al-Qaeda founder and leader had been dead for years. Similar uncertainty has surrounded the fate of Hitler after WWII, only instead of dying years before the war's end, many believe the Nazi Fuhrer escaped Germany to begin a new life in South America or elsewhere. Like Bin Laden, except for a few skull fragments which could belong to anyone, no body was ever shown to the war weary public, so why shouldn't people question the official story? 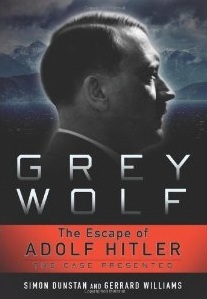 In their new book, Grey Wolf: The Escape of Adolf Hitler, Gerrard Williams and his co-author Simon Dunstan investigate claims that Hitler not only escaped to Argentina after the end of the war but that the deposed dictator even fathered children and lived until 1962. Richard Thomas: Thanks for taking the time to answer my questions Gerrard, I read your new book Grey Wolf over the Christmas holidays and have lots to ask you about, but how did you start your writing career and have you always had an interest in the Second World War? Gerrard Williams: Thanks for asking me, Richard. I trained as a Journalist with the NCTJ in Cardiff, but had always written for school competitions (Eisteddfod in Wales). Most of my life has been spent in international TV News with Reuters, BBC and SKY as well as time in Australia and Kenya. For people of my generation (I'm 52) WW2 always figured heavily in our lives. My Dad was a "Desert Rat" (8th Army N.Africa/Italy) and my mum was in the Army when they met. That and films, comics and books about the War always kept it at the forefront of our minds. Richard Thomas: Last year the internet was ablaze with conspiracy theories surrounding the death of Osama Bin Laden being announced on the same day as Hitler's death was made public, May 1. And oddly enough Prince William and Kate Middleton got married on the same day as Eva Braun and Hitler as well, 29 April. Do you think theories like these are in part due to the failure of historians to sufficiently investigate the fate of Hitler after the war, or, are there other reasons why people are still fascinated by conspiracies linked with the Nazis? Gerrard Williams: I'm not a great one for conspiracy theories. In 33 years as a journalist any I've come across – and there have been a few – always seemed to fall apart at the first serious investigation. We should remember that the Nazis were the embodiment of Industrialised Evil, and also the biggest criminal gang in History. They cast a long and fascinating shadow, why would a civilized nation like Germany behave so badly? Richard Thomas: What first persuaded you that the rumour about Hitler's escape from Germany in 1945 was anything more than just another conspiracy theory? Was it the revelation that the fragment of a skull the Russians have couldn't have belonged to Nazi dictator? Gerrard Williams: I was filming a series of documentaries in Argentina partly on the Malvinas/Falklands War anniversary when I came across the story. I was going to do a silly conspiracy theory film about it – it would have been my first – but so many people I met and talked to were so sure that he had escaped and lived in their country, I decided it needed more investigation. I teamed up with my old-friend and respected Historian Simon Dunstan and what we discovered shocked us both. There is far more evidence to his escape than to his death. Richard Thomas: If Hitler did escape from Germany why do you think this wasn't discovered or maybe even ignored by the allies and mainstream historians? Gerrard Williams: The amazing thing is that there were dozens of quite serious stories from news agencies and other sources that detailed his escape. I think elements in the US helped him and thousands of his supporters get away. Some people in Britain were complicit in the cover-up. Why did the head of MI6 hire an unknown medieval Historian, Hugh Trevor-Roper to write the "definitive" detective story of the deaths? Why didn't we put in serious investigators, Scotland Yard? Richard Thomas: What do you think happened in Hitler's bunker in 1945 and how do you explain the account of Hitler's bodyguard that the bodies of Hitler and Eva were burned and buried? Gerrard Williams: The details are in the book, but simply Hitler and Eva were swapped for two look-alikes. AH fled , and Bormann and "Gestapo" Mueller executed the two stand-ins when they were sure Hitler was clear. These bodies were allegedly burnt – although the Soviets at the time did not find any evidence of the bodies. They did find Josef and Magda Goebbels charred, but recognisable corpses and happily put them on display. Richard Thomas: How did you begin your research and what led you to Argentina? Gerrard Williams: I was sitting in a car-park in the Green Zone in Baghdad in 2005 wearing a flak-jacket, helmet in 35 degree heat smoking a cigarrette and a realization came over me. At 46 I was too old for "hard" news. I had always loved making long-form films and decided to see if I could make a living doing documentaries. I had never been to South America and starting with the letter "A" seemed sensible, hence Argentina. Since then I have been back 13 times, each time discovering something new and backing this up with intense research on-line, wading through literally hundreds of books, at Kew, in Berlin and in the US. Richard Thomas: Where are some of the eerie places you visited in Argentina and was there a witness or other evidence that particularly impressed you? Gerrard Williams: Hitler's home at Inalco is a strange place, a lovely estate which when built was virtually inaccessible, and the deserted Nazi-Funded Hotel Viena at Mar Chiquita is worth a visit. Richard Thomas: I've often heard it said Hitler was suffering with Parkinson's disease by the end of the war and wouldn't have lived long even if he hadn't committed suicide. What evidence is there that Hitler lived until 1962? And what do you think happened to the former German Fuhrer's remains after his death? 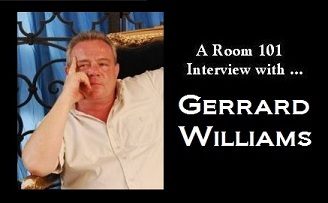 Gerrard Williams: There is no evidence Hitler had Parkinson's . It's pure supposition based on a couple of home movies which show his right hand "trembling" while he holds it behind his back. Hitler was 56 in May 1945, probably massively stressed and known to have been suffering gastric problems – today they'd probably call it IBS – but still a relatively young man. The evidence is pretty detailed in "Grey Wolf" the FBI taking sightings seriously, numerous eye witnesses to his life in Argentina. Since publication we have had new information which adds to this. As for the body, I don't know. My best guess it was cremated and scattered on Bormann's orders to maintain the fiction that he died in Berlin. Richard Thomas: One of the strangest revelations in the book is that Hitler and his wife may have had children. If this is true what do you think happened to Eva Braun and where do you think Hitler's children are now? Gerrard Williams: Eva Braun was 33 in 1945. There is a lot of information about the birth of their daughter "Uschi" in Germany pre-war and also a still-born child in the middle of the war which was attested to by Eva's Mother. She seems to have also been newly pregnant – according to close members of their circle – in May 1945. There were rumours – which we so far have been unable to prove or disprove – that she was still alive in 2000 when she would have been 88. The two daughters would now be in their late 60's and early 70's. We still have leads to follow up. Our last confirmed sighting was from a senior Buenos Aires Human Rights lawyer who says she met "Uschi" in the late 80's. Richard Thomas: Why do you think it is still important to find out the truth about the events of the final days of WWII over 65 years later? Gerrard Williams: I'm a Journalist – of the old school – I think the truth is something that needs to be told. Richard Thomas: Thanks Gerrard, where can readers buy the book and have you got a website you would like to plug? Gerrard Williams: Thanks very much Richard. The book's available on-line at Amazon across the world, Barnes and Noble stores in the US – and on-line from them, Waterstones and all good book shops in the U.K. People who are interested can check out greywolfmedia.com. We're currently working on our follow-up.